LEARN WITH THE SEASONS: Forage for and use Edible & Therapeutic Herbs. Autumn course. LEARN WITH THE SEASONS: Forage for and use Edible & Therapeutic Herbs. High Summer Course. Contrary to what you might expect, cities can be great places to forage for wild foods & medicinal herbs. John Rensten takes foraging walks in London and runs the websitehttp://www.foragelondon.co.uk/. He will share some of his tips with us about urban foraging. He is the author of The Edible City , a new book about the joys of finding wild food in the city. Robin is a highly-regarded forager. His website eatweeds is considered to be one of the UK’s leading wild food foraging sites. He is a co-director of Plants & Healers International, a non-profit that connects people, plants and healers around the world, he travels extensively documenting and recording the traditional and local uses of wild food plants in indigenous cultures. 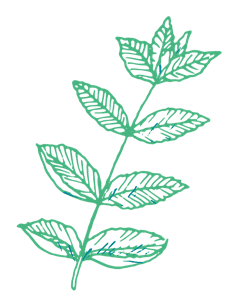 Robin will introduce us to ‘contemplating plants’: a method that helps people to slow down and connect to plants on a deeper level. Discover the fascinating world of edible and medicinal plants. Learn at your leisure, wherever you live, whenever you want. The Early Summer Course: This course features wild and cultivated medicinal herbs and edible plants that are usually available to pick and use in April, May & June (please note that seasonal variations in the weather will determine if and when the plants are available). It includes Nettle, Plantain, Cleavers, Hawthorn flowers and leaves, Silverweed, Daisy, Dandelion, Sorrel, Blackberry Leaves, Raspberry Leaves, Red Clover, Primrose and Elderflower. The High Summer Course: This course features wild and cultivated medicinal herbs and edible plants that are usually available to pick and use in July & August (please note that seasonal variations in the weather will determine if and when the plants are available). It includes Calendula, St. John’s Wort, Self-Heal, Meadowsweet, Roses (wild & cultivated), Rosemary, Yarrow, Lemon Balm, Honeysuckle, Raspberries (wild & cultivated) and Cleavers seeds. The Autumn Course: This course features wild and cultivated medicinal herbs and edible plants that are usually available to pick and use in September & October (please note that seasonal variations in the weather will determine if and when the plants are available). It includes sea buckthorn, elder berry, dandelion root, dock root, rose hips, hazel nuts, silver weed roots, blackberry, plantain leaves & seeds, nettle roots, the haws of hawthorn and guelder rose/cramp bark. Each course is supported for set dates while the plants are usually in season (i.e. you can receive help and guidance from me via our Private Facebook group and live webinars). Learn at you leisure! These courses do not require doing ‘homework’ or a time-commitment each week. I’ve designed these courses to fit in with busy lifestyles. You can engage with them at whichever level suits you best and you can return to them year after year, to study and use the plants when they are in season. If all that happens is that you start to recognise some of these plants growing around you then this is a very pleasurable life-enhancing interest to have; if you have more time then you can try making all of the recipes, post photos of plants to learn more about identification, have a go at herbal medicine-making and get advice about experimenting with some recipes of your own. Videos showing the featured plants that are currently in season and how to identify them. Videos or photos demonstrating how to include foraged herbs in an easy, everyday meal. 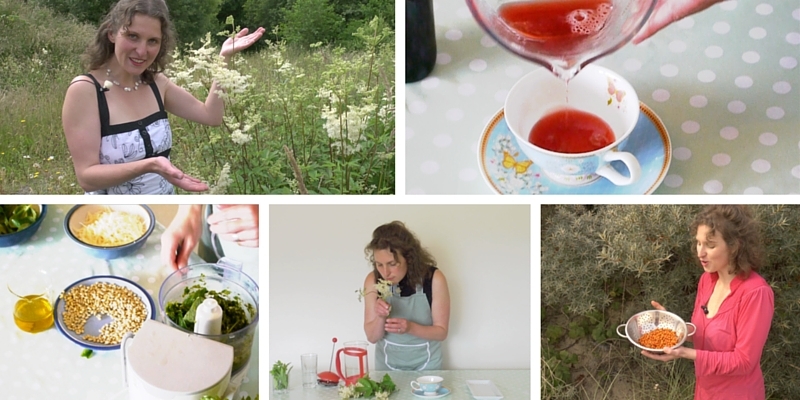 Videos demonstrating how to make your own herbal remedy, tonic or balm safely and easily in your own kitchen using ordinary house-hold equipment. Detailed documents about the herbs featured in each video so that you can read the key properties of each plant (e.g. nutritional content, medicinal uses etc. ), try out recipes and have clear guidelines so that you can use them safely. Suggested simple activities for you to try out to help you to begin to engage with the plants. Photographs of the featured herbs to help you to safely identify them. A chance to ask me your questions: The last week of each course features a bonus live webinar. This is your chance to put your questions to me so that you can feel confident about using your new skills (Please note: this is not a chance to have a medical consultation or to ask direct medical questions: I cannot treat people via phone, email, text message, Face Book or Skype but, I can educate you this way). Access to a private Facebook group: Here you can let us know how you’re getting on with your new journey into the plant world, post pictures of the plants that you’ve found, the delicious dishes that you’ve created and/or the remedies that you’ve made. I will pop in and out of this group so this is also a good place to check things that you are unsure of and post questions for me. It’s also a great place to receive the support and encouragement of others who are learning and to see new recipe ideas. Documents and recipe sheets for making herbal tonics and extracts e.g. tinctures, infusions, syrups, cordials, infused oils, ointments etc. My basic, jargon-free, beginners’ guide to safely identifying plants (to help you to avoid any mishaps when foraging). My guide to using herbs safely: for adults, children & in pregnancy; including when not to use them and when to seek professional advice instead. A list of recommended herbal suppliers so that you can buy herbs that you want to use but can’t find growing near you. Identification videos for each featured plant. My list of recommended books so that you can learn more about wild food foraging and herbal medicine. My list of recommended, reliable websites. Further study: a list of courses where you can train to become a professional, qualified herbalist; information on informal apprenticeships where you can gets some hands-on experience with an working herbalist. A list of suppliers of ingredients e.g. herbs, bottles, jars, oils, waxes etc. Herbs in the City: an info sheet with tips on how to forage when you live in towns and cities. A brief guide to organic versus conventional gardening: otherwise known as the alarming truth about weed-killers and why you should avoid them like the plague! A guide to common poisonous plants (so that you can avoid them!). Plants for bees: bees love herbs and herbs love bees! A list of herbs to plant to encourage bees into your garden. Free updates: if I update any part of these courses or add new lsesons then you’ll receive these updates free of charge. All students get life-time access to the resources (documents, videos, photos etc.) in this course. On-line support from Vivienne is currently provided seasonally but will not be available for life-time! “I am so delighted with your course. It’s consolidating stuff I knew and lots of new stuff that I didn’t. You’re a natural at it! Clodagh Kelly, Ireland. “I’ve just finished watching the webinar and I wanted to let you know that I loved it all….I liked your mix of videos and text, recipes and medicines. I honestly can’t think of a suggestion to improve it! As recommended in the Irish Examiner (National Newspaper): Click this link to read the review. I am a qualified and experienced professional Medical Herbalist (I qualified in 2003) based in Ireland. Over the yearsthousands of people have attended my lectures, talks, classes, guided walks, herbal clinic and/or have watched me on television. I am a knowledgeable, entertaining and engaging teacher. I have been teaching herbal medicine classes for 12 years. You can see my workhere. I co-presented a major national television series in which I foraged for and made an herbal remedy, natural cosmetic or wild food. I presented this show alongside celebrity chef Richard Corrigan and organic gardener Kitty Scully. Click here to see details of this television series. I’ve also contributed to two other television series since then. (One of them is currently in production; you can see details of the other series here). I have a BSc degree (with first class honours) in Herbal Medicine from the University of Central Lancashire, UK. I have to ensure that I am up to date with herbal medicine by doing Continuous Professional Development (CPD) every year. I constantly strive to learn more: about therapeutic and edible plants; about medical conditions and diseases; about scientific research and evidence. I regularly feature in national newspapers and television and am often asked to comment on issues affecting herbal medicine e.g. changes in legislation etc. I have spent several years researching local plants that were once popular remedies and food sources but which have fallen out of use or been forgotten. And my classes are very enjoyable and people return to them over and over again. The internet is full of information about herbs but little of it is reliable, lots of it is wrong and some of it is out-right dangerous! Learn from an experienced teacher that you can trust: learn from me! Do you have questions about this course? Then ask me! You can email your questions to me at info@theherbalhub.com. Please put ‘E-Courses’ in the subject line. This is not a qualification: after buying this course you will not be qualified to work as a professional consulting herbalist. It is not a medical consultation: We will look ways to improve general health with herbs and how to use safe and effective remedies for common ailments (e.g. colds, coughs etc.) but we will not learn how to treat specific, serious illnesses and diseases with herbs. We may mention these briefly and talk about them in general terms but, this is always an example of a case where I will recommend that someone consults a professional medical practitioner and/or qualified herbalist. I cannot treat people or give specific medical advice via phone, email, text message, Face Book or Skype. This is not a science course: we will not cover chemistry, medical trials or evidence for the effectiveness of herbal medicines (but I am working on one that will….). This is not a promise to identify every therapeutic and edible wild and cultivated plant. The information that you learn in this course is not to take the place of a qualified medical practitioner. It is for educational purposes only. Qualified medical practitioners are highly skilled and helpful people. Please consult one! They are there to help you. Enrol and if you are not happy in the first 7 days we will refund your money no questions asked.